Ananda Everingham (left) is one of the hottest actors of Thai cinema garnering international acclaim. He graced the awards night of the 12th Cinemanila International Film Festival held recently in quezon City. In this photo, Ananda poses with Cinemanila founder Amable "Tikoy" Aguiluz VI (right). 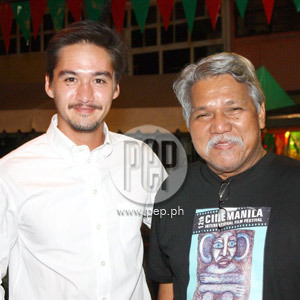 Thai actor Ananda Everingham was the special guest at the awards night of the 12th Cinemanila International Film Festival. The event was held last December 3 at Mogwai, Cubao, Quezon City. Ananda was part of the Thai horror film Shutter (2004 ), which was remade by Hollywood in 2008 under the same title. One of his recent movies is an action blockbuster titled Red Eagle, which will be screened at Robinsons Galleria on December 5 and 6 at 1:45 p.m. This movie was an official entry to the 15th Pusan International Film Festival 2010. Ananda will be available for Q&A with fans and the media. FILIPINO FILMS IN BANGKOK. In an interview held last December 3 at Mogwai, Ananda was able to share his thoughts on Filipino filmmakers. As a juror for the Bangkok International Film Fest in 2008, he was able to view and judge several Pinoy films. "There was a huge Filipino contingent," he told PEP (Philippine Entertainment Portal) that night. "We had five Filipino films. And three of them won. I was very impressed with Serbis by Brillante Mendoza." Serbis bagged the Golden Kinaree award during the 6th edition of the Bangkok IFF. The two other films were Jay by Francis Xavier Pasion (Special Mention in the main category) and When I Was A Child Outside by John Torres (Special Mention in the Southeast Asian competition). POSSIBLE MOVIE WITH ALIX. Ananda is also being strongly considered for a role in Adolf Alix Jr.'s film on the Spratly islands titled Kalayaan. The Thai actor says of Direk Adolf, "We've spoken on and off for many years. From seeing the films that he's made the last couple of years and how he's developed and so on, I'm very keen on working with him. "I understand that making independent films is tougher than your regular studio kind of thing. My favorite one from him is Adela." Ananda admits that the thought of becoming a director himself has crossed his mind. HIS FATHER'S STORY. The Thai actor then narrated his Australian father John Everingham's experience as a journalist in Laos. "My dad, at 16 years old, rides his motorcycle from Australia. His aim was to drive all the way to London. That's where we're from originally. "He gets to Laos when he's 18, he falls in love with my mum. And he's there for ten years working as a photographer and a journalist. "The government thought he was an American spy so they kicked him out of the country. He got pretty peeved so he swam back across the Mekong river and brought my mum back to Thailand and became this big commotion. "The Laos government banned him and he became the poster boy for democracy. And they made it into a film. "We weren't allowed to go back to Laos until I was 16. 60 Minutes actually spoke to the government and brought us back." Ananda doesn't see himself portraying the role of his father in a movie. Instead, he names the most appropriate star for the role. "The perfect guy I had always envisioned, if we ever had the chance to make the film, is Heath Ledger. "He would've been the perfect guy. He looks a bit like my dad, he was at the right age. "It's terrible that he passed away. That would've been the perfect role for him though." John Everingham wrote an article in Reader's Digest about his daring rescue, wherein he scuba dived under the Mekong River to rescue his lover from communist-ruled Laos in 1977. This became the basis of the 1983 NBC television movie, Love Is Forever. Michael Landon, one of the biggest stars of that time played the lead role. In the series, Ananda's mom's name, Keo Sirisomphone, was changed to Moira Chen.